A historic day from Megatron. Players fighting on the sidelines. A quarterback fake for the ages. This game had it all. On the heels of a history-making day by his otherworldly receiver, Calvin Johnson, Detroit quarterback Matthew Stafford engineered a ridiculous last-minute comeback to stun the Dallas Cowboys, 31-30. Here's how it went down. After a Dan Bailey field goal, the Lions got the ball with no timeouts, 1:02 on the clock, and 80 yards to go for the touchdown and a win. Clearly, it would be up to Johnson (12 catches, 290 yards at that point) and Stafford to make it happen. 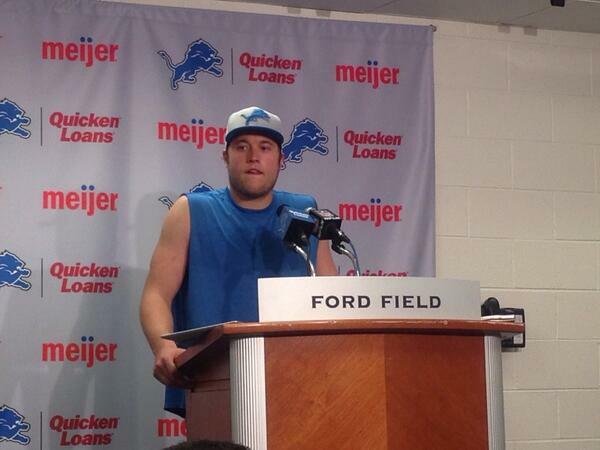 Also worth noting that Stafford had endured something of an up-and-down game. This attempted "tackle" on an interception he threw was most definitely the low point. And yes, Dallas had a 99% win probability with less than two minutes to play. So Stafford got things rolling with a 17-yard pass to Johnson. Then came this sweet 22-yard pass to Johnson to get the Lions down to the 1-yard-line. This was Johnson's 14th catch of the day for 329 yards receiving — the second-highest single-game total in NFL history. So with no timeouts left, Stafford is clearly going to spike the ball to stop the clock and set up a play. Once the ball crosses the plane of the end zone line, the touchdown is good, and the on-field officials called it almost immediately. An extra point later and Detroit had the lead. The Lions and their fans at Ford Field went nuts. The Dallas sideline, not so much. Tony Romo tried to corral Jason Witten and Dez Bryant for a quick meeting before the kickoff, but Bryant was elsewhere. So Witten went to go get him — and that's when it turned ugly, with both players screaming in each other's faces. Witten and Bryant jawed for a few more seconds, and then it was time for the Cowboys to attempt a miracle finish. But a hook and ladder attempt on the final play went nowhere fast, and the Lions had their last-second victory secured. Jim Schwartz, VERY EXCITED ABOUT THIS WIN. After the game, Stafford admitted that he actually was going to spike the ball until he saw the linebackers out of position. But he'd also let his emotions bubble over earlier in the game, getting in Witten and Romo's faces as well as members of the coaching staff.